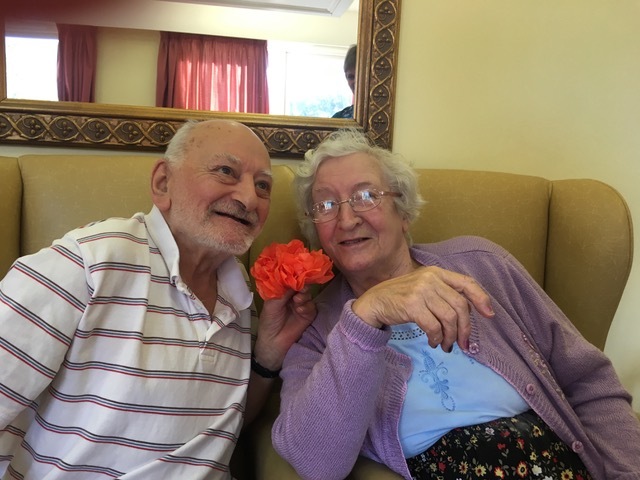 In the light of the recent “Care Home for Four Year Olds” documentary being shown on Channel 4, we are proud and delighted to be piloting bringing similarly heartwarming intergenerational work to care settings in Leicester. 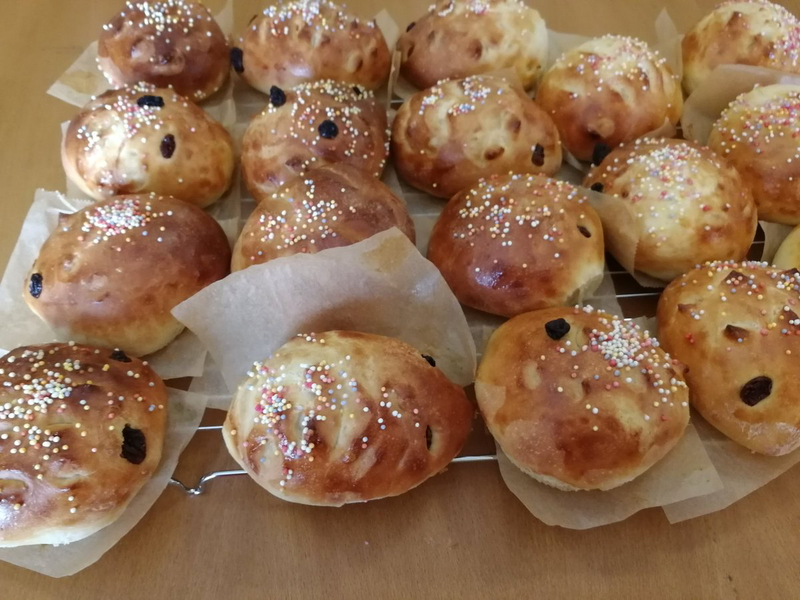 So far, our Baking a Difference project is bringing together nursery children from Blossoms Day Nursery and South Lodge care home to make, create and eat gorgeous bread, as well as to share time, stories and new experiences together. 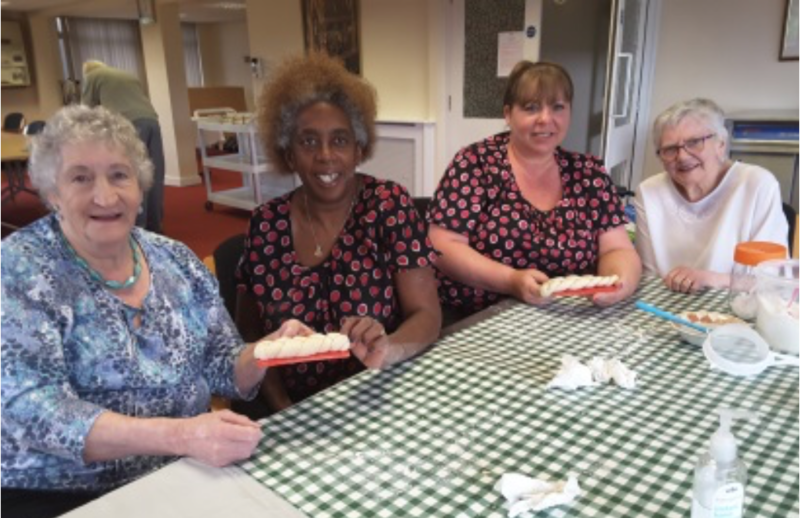 Having been busy baking, the nursery children brought in Diwali present of bread sticks dipped in icing and sprinkles (above) for the care home residents to enjoy. We are very excited indeed to see the project developing in this way and to be bringing generations together in this way in order to create, develop and strengthen community connections between people and places. We hope to be able to do much more of this during the project. We were really pleased to be working closely with members of the local community to run sessions in three different care homes making Diwali garlands during the recent festivities. Working with fantastic groups of students from the University of Leicester, we were keen to ensure that the long cultural tradition of marking the Festival of Light was spread to an older audience here in the city. Lots of fun was had by everyone involved in our Diwali wreath making workshops, including this duo in Evington! 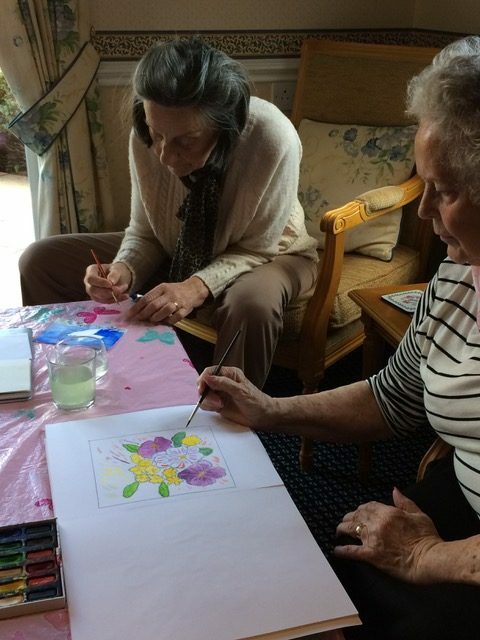 The close concentration (caught on camera) of these two wonderful older women in sheltered housing as they enjoyed one of our regular art groups. Over the years, we have seen that painting is therapeutic and mindful for many people of all ages but particularly for people as they age. 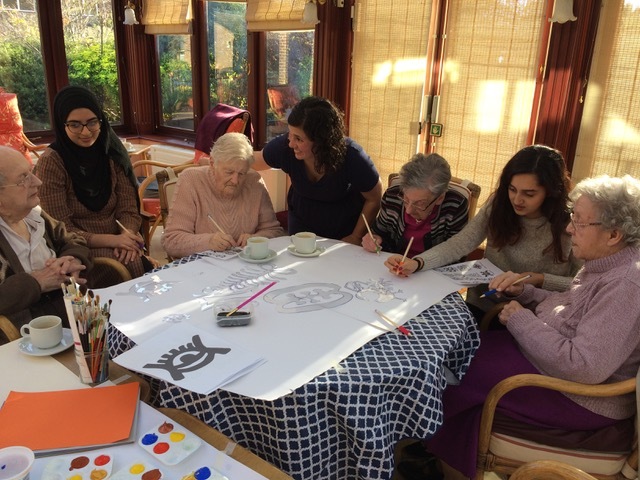 We are delighted to have volunteers visiting older people across Leicester and Leicestershire regularly to support L4A’s ongoing art and craft groups. From Market Harborough to Quorn, we will try to support care settings to provide learning and arts activities for their residents. Collaborating closely, residents of one extra care unit each create a separate part of these designs using lino printing techniques and then combine them together to form a final finished piece that is more than the sum of the separate parts. 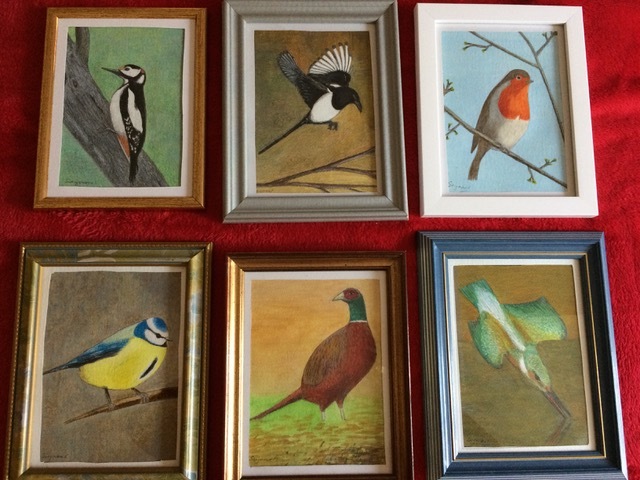 These beautiful birds have been proudly painted by Neil who really enjoys the regular art group we host in his sheltered housing unit, even if he is usually the only male attending it. He has proudly framed this series of gorgeous British birds he has produced and we think that he is right to be proud of his work. 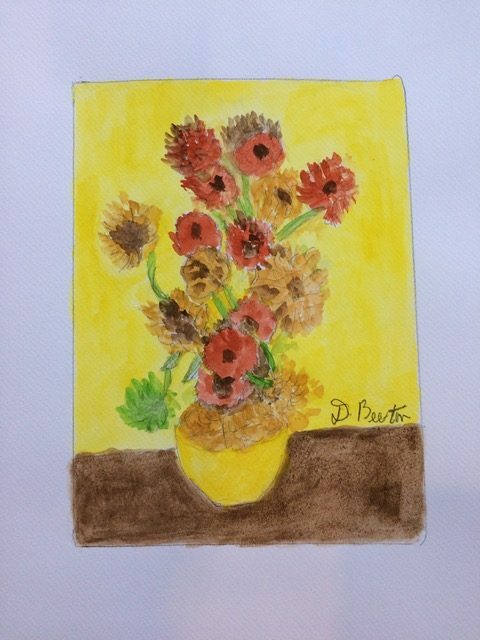 Doreen is very proud of her sunflowers and spent time studying Van Gogh’s original in order to create her own interpretation here at her own art group. Of course, at L4A, we don’t mind if you’re recreating original masterpieces or inventing your own but we are delighted to be supporting so many older artists across Leicester and Leicestershire to feel proud of what they draw, paint, sketch, print, chalk, ink and much much more with us each and every week. 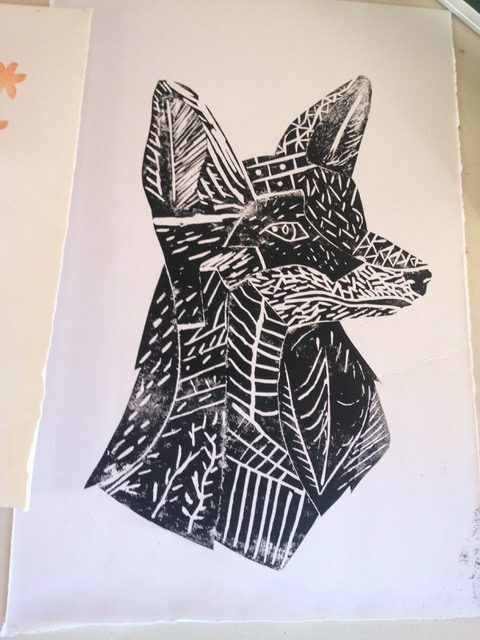 We are always looking for more volunteers to support our art groups across the city and county, or even to start new ones so please do get in touch with us via email or here if you think you could help out at all, or if you would like to support our work in another way – we’d love to hear from you! 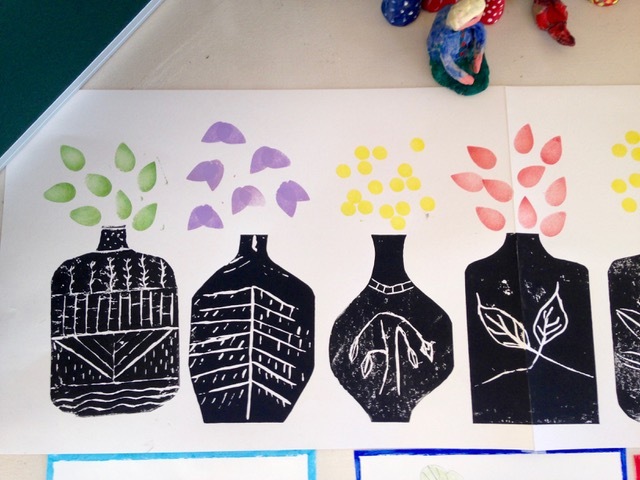 We are delighted to be running a small pilot project called Art with Heart exploring different artistic cultural styles with people who have dementia and memory loss. 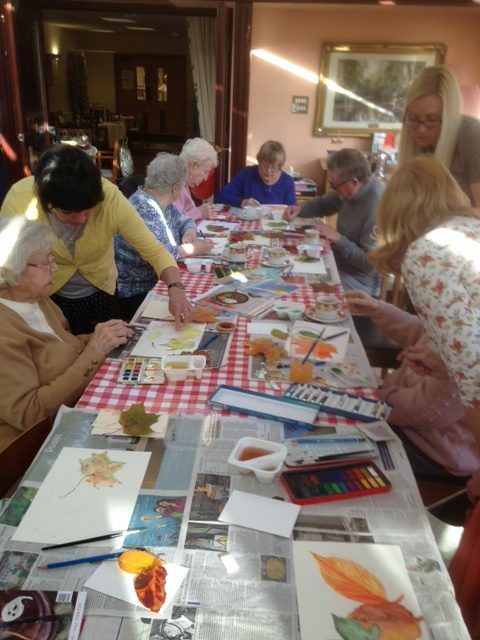 The first Art with Heart session took place on Saturday 10th November at Agnes House in Wyggeston’s Hospital in Leicester. The theme was Africa and they talked about Africa, looked at typical African design motifs and then had a go at copying or designing and painting their own. 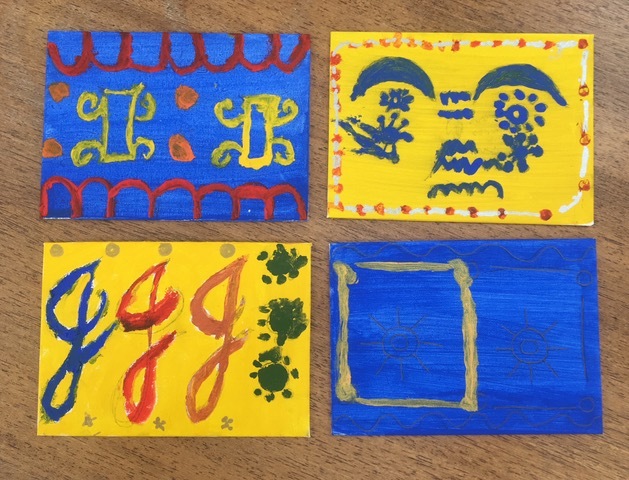 The group looked at bold colours and striking patterns and worked together to create a series of distinct designs of their own. The session was led by Vicky, a very experienced artist and longstanding L4A volunteer and she was supported with the help of student volunteers Safooraa and Asra. The theme for the next session is South America and we look forward to seeing the results. After 12 successful pilot sessions in three different care settings, the Baking a Difference project has sadly come to a close. For now. Having conducted experiments about yeast and gluten, learned how to create our own sourdough starters and discussed our own individual personal histories with bread, we plaited, kneaded and ate our way through all sorts of dough. 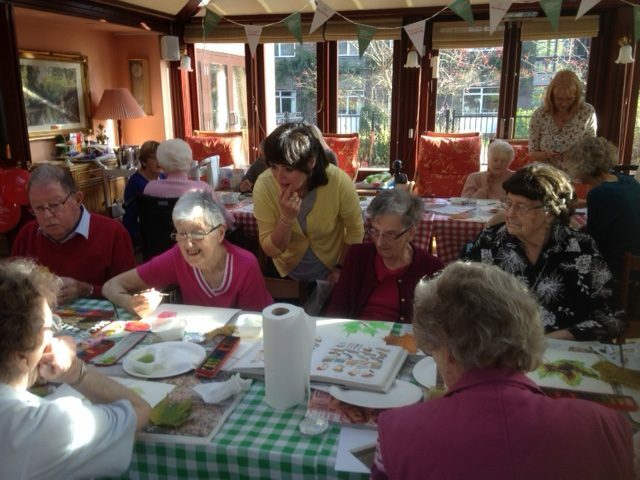 As well as being great fun, Baking a Difference workshops proved to be bonding and sociable for everyone involved. 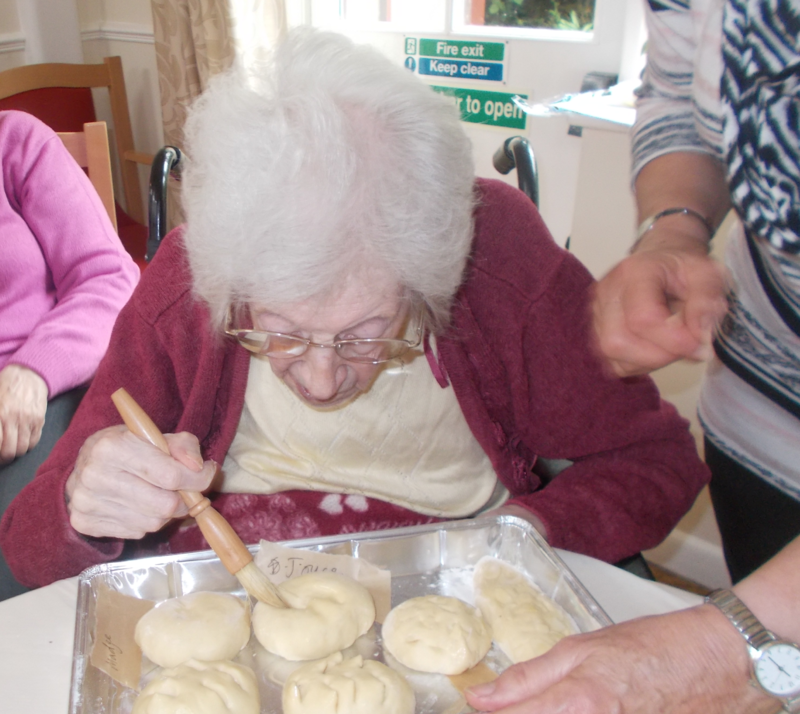 The smell of freshly baked rolls wafting through the home brought staff, visitors and other residents to see the activities underway and prompted many to join in future sessions. 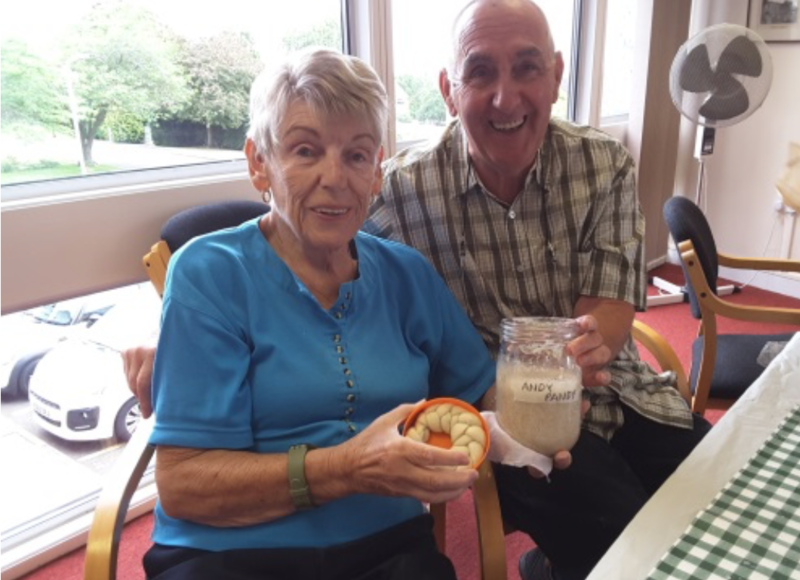 We are grateful to our partners Planet Leicester Bakers for their thoughtful input into planning and delivery the sessions to two nursing homes and a sheltered housing unit, sensitively tailoring the workshops for the individuals living within each environment. We would love to receive any feedback from you about this project and it’s work so please do get in touch with us.